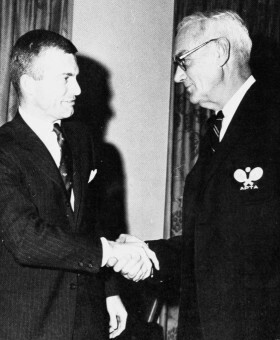 Kindred was elected to the APTA Board in the early 1960's and served for 16 years, holding the positions of Treasurer and Tournament Director, and single-handedly produced the APTA newsletter for many of those years. G. Estabrook (Brook) Kindred continuously served the cause of platform tennis for more years than practically any other individual. He was a “do-er,” tireless, unselfish, and dedicated to the support and promotion of the game. In addition to his many years of service to the APTA he served on numerous National Championship committees, and was the tournament chairman of the 1968 Men’s Nationals. In the 1970′s, Kindred was instrumental in the formation and administration of the APTA Umpires Committee, which, at its peak, totaled more than 30 members. Although that activity no longer formally exists, he continued to serve as a coordinator and chair umpire for APTA championships and other sanctioned tournaments, and went far and wide to officiate, no matter what the weather. Brook was also the driving force in inaugurating the Hall of Fame activity, originally known as the ”Honor Award.” He served on the Hall of Fame Committee from its inception in 1965, did the bulk of the research on each Hall of Fame inductee, designed the green jacket with the Hall of Fame logo for the men and the charm bracelet that was awarded to the women, and gave a majority of the induction speeches. By the time he was inducted, 63 individuals had preceded him into the Hall he helped make a reality. Kindred was born and raised in Scarsdale, NY, and was a long-time member of Fox Meadow Tennis Club. He attended Hackley in Tarrytown, NY, and then went to Colorado College. Upon graduating, he began a career in advertising at McCall’s in New York City, and then moved to Scholastic Magazine where his creativity, innovation and interpersonal skills earned him several awards. After many years of service, Brook retired from the company as Executive Publisher. Paddle was not only a part of his life, but of his family’s as well. Brook’s children remember a house where paddle tennis draws were laid out on the dining room table, warm clothes for officiating were neatly stacked, ready for use in the cabinets and closets, and, at the first sign of cold weather, a rousing game of paddle became the family activity. Kindred was known within the platform tennis world for his skill and fairness as an umpire. A top player commented that he was always glad to see that Kindred was assigned to umpire his match, as he was in control, fair, knowledgeable, and willing to step up and make the tough call. It was not surprising that he could make the tough calls since he was a USTA umpire in the days before money was paid for these assignments. Brook called many matches at both Wimbledon and Forest Hills for the tennis greats of the 1970s to 1990s, including John McEnroe, Ilie Nastase, and Jimmy Connors. His commitment to the history of the game is also well-known. In 2000, the APTA created the Platform Tennis Museum and Hall of Fame Foundation, with the goal of establishing a Museum to commemorate landmarks in the game and honor Hall of Fame inductees. As a student of the game, Brook was already considered a valuable source of knowledge to younger players anxious to learn about the founding fathers and the storied history of the game. 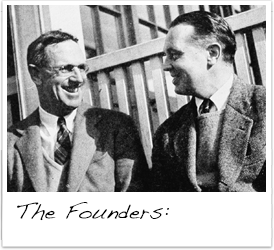 Not surprisingly, he was elected as one of the trustees of the Foundation board because of his long-term knowledge and his Scarsdale roots. He was an invaluable contributor to the Foundation’s ‘efforts until his death in 2006.